I don’t mean that you should put your leafy greens out so the bugs don’t go hungry (like you would food for a stray cat). I’m merely saying it’s ok that the bugs have taken a few bites of the same leaves you’re eating for dinner! Unless we spray harmful pesticides on our vegetables is it impossible to ensure that all crops will be bug bite free. And frankly, I’m ok sharing my greens with the bugs, considering the alternative. You might see lots of good looking organic leaves coming from California, without ever seeing any damage from those pesky bugs and wonder why. Our organic farm is surrounded by trees, and is full of weeds, wildlife and millions of organisms. A large Californian farm will typically have drier, sandier soil (and less inhabitants in it), and is surrounded by more soil (not many trees in the Californian farmland!) Also, California is lucky to not have half the predatory bugs that we experience due to their climate. 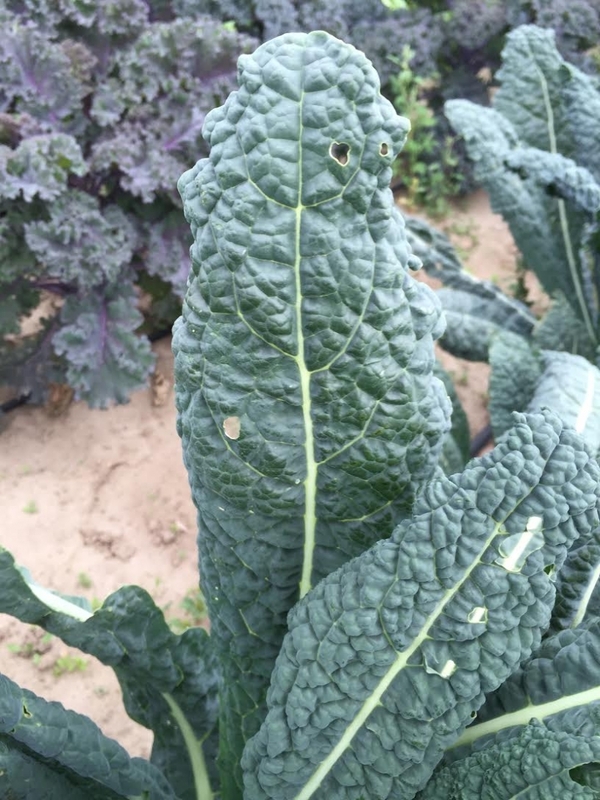 Bugs love brassicas (cabbage, kale, broccoli) and hot leaves such as arugula and mustard greens. We try our best to protect them from the bugs, using organic methods like cloth row covers, but sometimes they make their way in for a snack. We value the health of ourselves and our workers and support a healthy ecosystem by growing organically, so if you find holes in your leafies, know that you are doing the same.